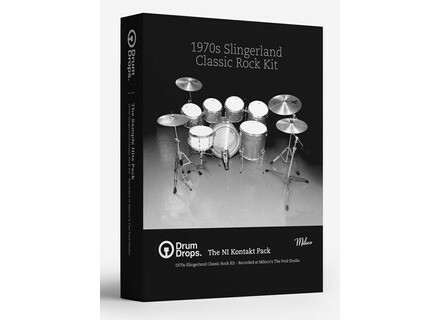 1970s Slingerland Classic Rock Kit, Virtual Drum/Percussion from Drumdrops. 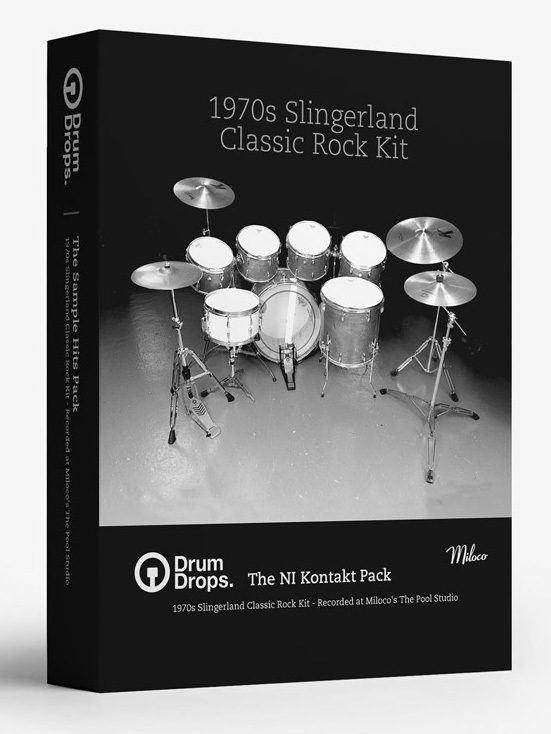 Drum Drops will launch tomorrow at 16H BST a new 1970s Slingerland drum kit for Kontakt that 15 of you can get for free. The new Drum Drops 1970s Slingerland Classic Rock Kit sampled drums for Kontakt comprises a 24“ kick, three 12”, 13” and 15” rack toms, an 18” floor tom and a Slingerland Radio King 14”x7” snare with dampen, non dampened, center, rim, cross stick and edge articulations. Cymbals used used on this kit are from Zildjian, with a 22” K Custom ride, two 18” K Dark Medium Thin and 16” Vintage Cie crashes as well as New Beat 16” hi-hats. The kit was recorded with 16 velocity layers and 5 round robins for each drum, 10 velocity layers and (12 for hi-hats) and 5 round robins for the cymbals. Recordings were performed in the Miloco The Pool studio by engineer Ben Thackeray and then mixed by Alan Moulder (Nine Inch Nails, The Killers, Foo Fighters, Led Zeppelin, Arctic Monkeys…) at Assault and Battery 1. The 1970s Slingerland Classic Rock Kit collection is already available in Multi-Velocity, Single Hits, Drum Replacement, All Samples and One Shot Sample Packs, a BFD edition is on its way and the Kontakt 5 Pack will be released at tomorrow, May 13th at 4pm BST. This specific edition includes 6,825 samples in total and the custom GUI for the Native Instruments sampler gives you a mixer and a Mic Blend feature to manage the microphones, multiple convolution reverbs from different studios and gears used by Drum Drops, a randomize tool for the round robins, a 4-band EQ and transient master on each channel, a stereo bus with compressor, an 8 channel step sequencer and a collection of MIDI grooves. Drum Drops also included MIDI mapping for V-Drums. The kit will be free for the 15 first who add the kit to the cart on drumdrops.com ; the next 50 purchasers will benefit from the special price of £15, then the price will rise to £20 for the next 50, then £30 for 50 more and if you’re late, you’ll pay the full price of £40. The SampleRobot Volca-X edition is out Announced last March, the Skylife SampleRobot Volca-X special edition for the Korg Volca Sample is now available with an early bird offer. The WNP Channel Strip E871 for $9.99 WNP Sounds offers a great discount off its Channel Strip E871 VST plug-in for Windows for a limited time. Universal Audio updates UAD Software to v8.1 Universal Audio adds three new plug-ins to the UAD-2 and Apollo platforms in the newly released UAD Software v8.1 update.